Several years back I bought a video from Rising Sun Productions titled the New Gladiators.I largely purchased it because it was supposed to have had more than 30 minutes of Elvis Presley practicing karate on it.At least that's how it was advertised.However when I recieved it the "king of rock and roll" was nowhere to be found.He had put up the money for this documentary about the 70s karate scene,but he didn't appear in it.Buyers were then informed that Rising Sun did in fact have the Presley footage,but they were going to release it in an entirely different package.Can you say "rip-off"? Hey I liked the documentary.It featured some of the best martial artists from that era.But once again I bought the tape for the Elvis footage which is what Rising Sun used as the selling point.Well that footage has turned up on this DVD.And if you're an Elvis completist I don't see how you can't add this to your collection.This is more or less a home movie of Elvis,his bodyguards,and several martial artists,including Bill Wallace,giving a demo at a Tennesee dojo.The audio is awful and it's the major reason I don't give this DVD more than 4-stars.It has a commentary by Wayne Carman but that should have been kept seperate because with it we can hardly hear what Elvis and the other particpants are saying.The disc has a few really cool extras.There is an illustrated booklet about Elvis'involvement with karate and six picture postcards with Elvis in his custom-made gis.There are even outtakes from the famed '68 Comeback Special with Elvis rehearsing a martial arts routine.Once again if you're an Elvis fan you should own a copy of this DVD. I enjoyed the "Elvis Presley Gladiators" DVD. It was great to see vintage and never before seen footage of Elvis doing Karate. Something he had a passion for besides performing on stage. The movie picture is clear however the audio of Elvis speaking is not. The DVD should have been digitally remasterd with chapters and scene selections included for a better quality film as a tribute to "Elvis the King" of "Rock n Roll". Elvis fans will enjoy. Something which makes this DVD worth buying is an illustrated booklet about Elvis involvement with karate and six picture postcards with Elvis in his custom-made uniforms. There are also some outtakes from the "68 Comeback Special" of Elvis rehearsing martial art routines. Once again if you're an Elvis fan you should own a copy of this DVD. 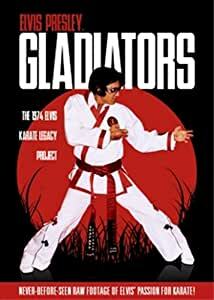 5つ星のうち5.0Elvis really was a black belt in Karate as seen in this DVD! 5つ星のうち5.0It’s elvis and I love it. It’s elvis and I love it!!! I purchased back in 2011, I’ve watched it few times. Being an elvis fan and impersonator... it never fails me because it’s elvis. Heard so much about this never completed film project over the last 35+ years and after seeing it, it was fun to recognize some of the selected clips that had been used in other Elvis documentaries (mostly Linda Thompson). It is really a series of home movies and the guy doing the narrating keeps repeating the same comments over and over. After 10 minutes of his repetitive comments, I finished watching it with Elvis music in the background, I had to "mute" the narrator. I very much enjoyed the film.